Mike Conley was spotted wearing Stephen Curry’s signature shoe from Under Armour at practice this week. This is of interest because Conley was formerly signed to adidas, although his deal was set to be up at some point this summer. There’s been no announcement of Conley signing with Under Armour, but wearing another company’s sneaker either means that a deal is forthcoming, or that he’s now an unrestricted sneaker free agent. Ari Alexander of WMC Action News wonders if a signature shoe could be in Conley’s future. Under Armour is starting to build a bigger basketball roster, starting with Curry. The Maryland-based apparel brand also has Charlotte Hornets point guard Kemba Walker, Detroit Pistons point guard Brandon Jennings, Nuggets rookie point guard Emmanuel Mudiay, and former Grizzlies and current Milwaukee Bucks point guard Greivis Vazquez. Conley is arguably a bigger name than all of those of players outside of Curry. There is certainly a possibility Conley could get his own shoe. If Conley wearing Curry Ones at training camp means he has indeed moved on from Adidas, watch out for a signature shoe as the stable of UA basketball athletes is more conducive to featuring Conley as a star. The Memphis Grizzlies are already marketing him as such, putting a giant banner of Conley in front of FedExForum. 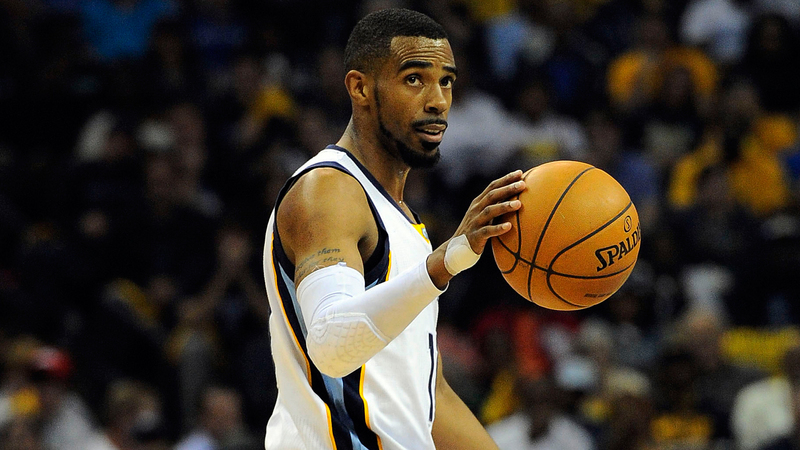 With his own shoe, the rest of the country could have a chance to appreciate Conley the same way Grizzlies fans do. It’s worth noting that just because someone is signed to a footwear deal, it doesn’t mean they’ll get the signature treatment. Nike, for example, only has four signature basketball athletes — LeBron James, Kevin Durant, Kyrie Irving and Kobe Bryant — but a ton of players around the league are signed to the company as endorsers. For Under Armour to make a splash in the industry, they may have to begin to target under-the-radar players like Conley, and make the masses aware of just how special they are. The problems in marketing Conley can be tied to a non-flashy style of play, and the fact that he plays in a small market like Memphis. But he’s widely-regarded as a top-10 point guard in the league, so the talent is there. It’ll be up to Under Armour to market it properly in the event a deal with Conley is eventually reached.